In the very beginning, the European Union was established in order to challenge the politics and economy, to give Europeans a field to cooperate and to unify their nations even on grounds of culture. Through all these years various mechanisms were implemented to clarify and stabilize the situation, no matter what background it had. Surely, Europe experienced a lot of conflicts but thanks to that it learned how to react in certain situations and to what focus its attention the most. Although, currently, the EU is struggling with migrants and the presence of United Kingdom within the Union is questioned, there are some issues which are not being discussed almost at all but seem to be crucial when talking about European integration. Europe of multitude of languages is both advantage and disadvantage. International arena is a place where not only political and economic interests intersect each other but is also a background highlighting cultural differences, especially languages. Hence international communication is difficult on any grounds, dealing with multilingualism is a first challenge of all international organizations gathering entities which speak in different languages. This is why, in order to ensure good communication within its structures, some languages are established to be official and to which all the documents, declarations or agreements are being translated. The bigger the organization is, the demand for smooth communication increases. Citizens of the Union shall enjoy the rights and be subject to the duties provided for in the Treaties. They shall have, inter alia: (…) (d) the right to petition the European Parliament, to apply to the European Ombudsman, and to address the institutions and advisory bodies of the Union in any of the Treaty languages and to obtain a reply in the same language. (…). At this point the EU successes since it united in diversity. However, with so many languages and texts, it is easy to notice the danger which the EU has to face with when implementing its innovative linguistic pluralism policy. Multiple translations rise a further risk of not presenting the correct content of the message (sometimes it is a translation of a translation). Therefore, it causes some logistic and financial issues and then all these infringements can have serious consequences, e.g. conflict between member states or inconsistent application of EU law. The Union seeks to facilitate crossing language barriers for delegates and representatives of member states, barriers that could limit full and comprehensive participation in the work of EU institutions. This is achieved by simultaneous translations which are especially important during plenary sessions of the Parliament, during which there are 800-1000 interpreters translating the text from original language into their natives. However, taking into account constraints of time and money, translation of all documents to all working languages is impossible. Therefore, the most commonly used are English, French and German. To sum up, linguistic diversity is one of the factors that undoubtedly distinguishes the European Union but also brings many difficulties when speaking about its practical use. Since there are more than 500 language combinations within the EU working languages and all of these translations have to be done, sometimes the translated versions are not completely identical and, consequently, bring many legal issues in the process of further implementation. Since the last parliamentary elections, Spain has been suffering from an institutional impasse as the leader of the winning party People’ Party (Partido Popular – PP), Mariano Rajoy, turned down king Felipe VI’s offer to form a new government. He explained his decision by stating that he does not have the absolute majority in the parliament but rather a majority of negative votes that would be against any of his proposed list of a government. As a result, the leader of the party in second place „Spanish Socialist Workers’ Party” (Partido Socialista Obrero Español – PSOE), Pedro Sánchez, was asked by the king to form a new government instead of Mariano Rajoy. However, as the PSOE party neither has the absolute majority, negotiations with other parties are necessary. Thus its leader asked for a period of a month before handing over his list of the ministers. In order to fully understand the actual political situation in Spain, we should focus on the results of the parliamentary elections. On the 20th of December of 2015, the results of the parliamentary elections have revealed the end of the two-party system that was well-established, as the seats have been shared between four parties. The party with the most votes casted was the right-wing and conservative People’s Party with Mariano Rajoy as their leader (who was the previous head of the government). They earned 28.7% votes and 123 seats won in the Congress of Deputies. The Spanish Socialist Workers’ Party was the second party to have the most votes casted : 22% with 90 seats earned. The third party that received 20.7% and 69 seats was the left-wing party, created in 2014, Podemos (translated from Spanish as „We can”), with Pablo Iglesias Turrión as their leader. The 2015 parliamentary elections were their very first election. 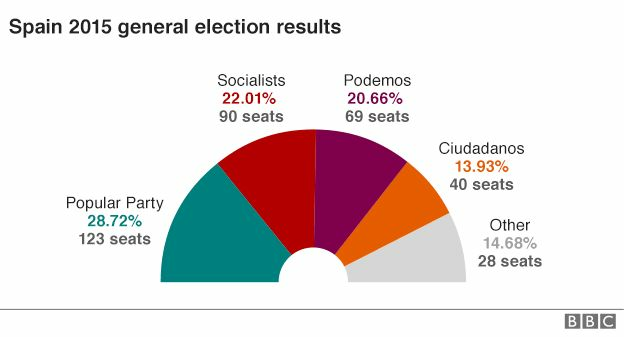 The fourth party that earned a decent number of votes is the centre-right party C’s which stands for Ciudadanos (translated into English as „Citizens”). They won 40 seats with 13.9% of the votes. The parties that arrive in fifth and sixth places are Catalan nationalist parties : Republican Left of Catalonia (Esquerra Republicana de Catalunya – ERC) and Democracy and Freedom (Democràcia i Libertat – DiL). They have earned less than 3% out of all of the votes. This considerable split of the votes has a consequence : no party has the absolute majority, that is to say none of them have received at least 176 seats (half of 350 seats plus one seat). Even though the PP has won the highest number of votes and thus the possibility to form a government, no other party wishes to form a coalition with it since it is rumored to be utterly corrupted. This led to Rajoy’s refusal to form a government. As a result, we could say that the fate of the political issues is now in Sánchez’s hands. However, it is not the case because even if he forms a coalition with one of the young parties Podemos or C’s, they would still not have the absolute majority. Sánchez could count on a coalition with the socialist electoral alliance Popular Unity (Unidad Popular), but they have only won two seats in the Congress of the Deputies – hence the necessity to have a coalition PSOE-Podemos-C’s. However, the problem is that these parties have different opinions concerning the Catalan independence. Basically, Podemos is in favour of organizing a referendum concerning the independence in this region, unlike C’s. Yet Sánchez does not seem to want to surrender as he may intend to have a consent regarding the fight against unemployment, social inequality and corruption, and he might propose a constitutional reform to move towards a federal state in order to regulate the Catalan issue. On the other hand, if Sánchez plans to leave C’s out of its negotiations and rather have a left-wing coalition PSOE-Podemos-Popular Unity, which would be more plausible and feasible, they would still not have the absolute majority. In the end, they would need the votes of the Catalan nationalist parties to be added to their votes, that would request the independence of Catalonia. But these are only suppositions – at this time of the year, we cannot make clear statements. The transition from a two-party system to a multi-party system illustrates the lack of trust of the Spanish people towards the long-standing parties as they cast their vote for recently created parties. This switching means that Spanish people have no longer put their faith in the „incompetent” politicians of the well-established parties but rather in young political parties, with leaders showing their will and vigour to change the country, yet without any experience of the political field. This political crisis is the inevitable consequence of the economic crisis that has affected Spain since 2008.